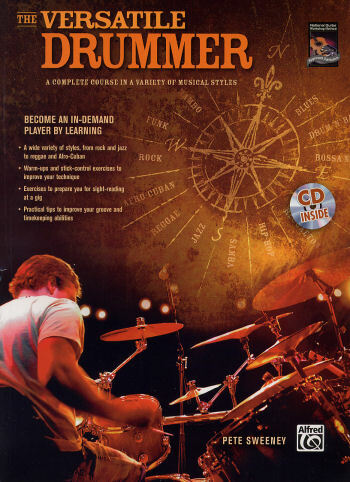 The promo says that the goal of this book and CD is to help you become an in-demand drummer. Let's check it and see if it measures up!. Reading Exercises - Includes basic music notation terminology, note values, and exercises to help the beginner become familiar with rhythmic patterns from quarter notes through triplets and sixteenth notes. Stick Control Studies - This chapter contains exercises using various sticking patterns, similar to George Stone's book Stick Control, and touches on some accented studies and rudiments. Eighth-Note Rock Beats - This one opens up with some basic rock beats and gets into closed and open hi-hats patterns and syncopated rock. Sixteenth-Note Rock and Funk Beats - Opening with single-handed sixteenth note patterns on the hi-hat, this chapter quickly moves into two-handed hi-hat patterns, funk beats with ghost notes, and closes with paradiddle funk beats. Triplet-Based Grooves - This chapter concentrates on the popular Blues shuffles, and Rock shuffles including half-time grooves. Afro-Cuban Grooves - The Clave and its variations, Cascara, Mambo, Songo, Guaguanco, Cha-Cha-Cha, Merengue, Mozambique, Rumba, and various African based grooves are covered in this chapter along with variations of each of the basic patterns. Contemporary Drum Styles - This chapter contains Reggae, New Orleans, Train, Soca, Reggaeton, Hip-Hop, Jungle/Drum 'n' Bass, classic Bo Diddley, and 7/8 Drum Beats. Brazilian Rhythms - Concentrates on Bossa Nova, Samba, Baiao, and Batucada rhythms. Jazz - This chapter opens with the basic ride cymbal jazz "time" pattern and moves into snare and bass drum variations, triplet coordination, and examples of phrasing over the bar line. Concludes with brief examples of jazz patterns in 3/4 and 5/4 time. Groove Embellishments - The final three page chapter contains suggestions on how the use of sixteenth-note and thirty-second notes can add some excitement to a groove! Subtitled "A Complete Course in a Variety of Musical Styles," I would more accurately describe this 95-page book with included audio CD as a "Practical Course in a Variety of Musical Styles." Let's face it, a book the size of an encyclopedia could hardly be considered complete! That said, I feel the book and CD is of great value especially to beginning drummers. More advanced drummers, looking to expand their musical horizons, will also find the included musical styles and their variations useful. And the audio CD will be of great help to drummers who want to verify their interpretations of the written patterns. A retail price of only $19.95 represents a great value for both this book and CD combo from Alfred Publishing and the National Guitar Workshop.